Renowned British mountaineer delivers lecture on leadership at the inauguration of the Cass MBA Expeditionary Society. Cass welcomed renowned mountaineer and Everest legend, Sir Chris Bonington to deliver an exclusive masterclass in leadership for inauguration the Cass MBA Expeditionary Society. Sir Chris is the Patron of the new society in its inaugural year. Fellow mountaineer and Cass Honorary Visiting Professor, Dr Rodrigo Jordán, introduced Sir Chris to a packed auditorium sharing his own story of meeting Bonington for the first time as a young mountaineer. 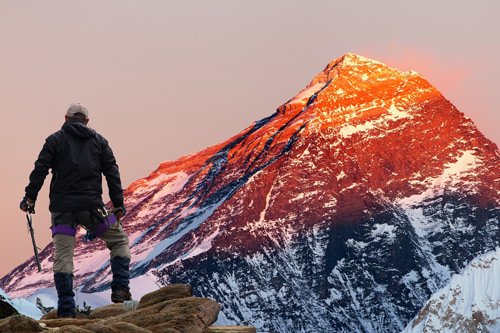 What Everest can teach us about leadership? Leadership is having a very clear vision... there can be no confusion in your objectives. The Cass MBA Expeditionary Society will explore leadership through experience. It aims to build a community of Cass MBA students and alumni interested in developing leadership skills through experiential learning in unique stretch experiences. You can join the society here. The Cass MBA programme is delivered in both a full-time and Executive part-time format, with programmes delivered in London and Dubai, and our MBA students have access to the best research and industry knowledge.